Berlin, 12.09.2018 – The German Council for Sustainable Development (RNE) recommends that the Federal Government take on a more active role in promoting realisation of the UN’s Sustainable Development Goals. In the view of the Council, cooperation with and in the bodies and committees of the United Nations should be elevated, in addition to national implementation and bilateral cooperation. 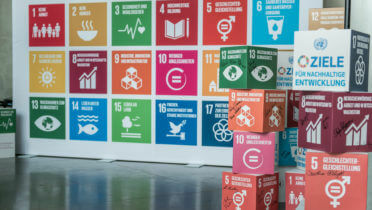 The UN’s Sustainable Development Summit in September 2019 will see the first meeting of state and government leaders since the 17 global Sustainable Development Goals were agreed in 2015. The focus of this meeting will be to lay key groundwork for ongoing realisation of the 2030 Agenda. “We will not achieve the 17 global Sustainable Development Goals simply by waiting around. Germany must take on more responsibility in the area of multilateral cooperation. To this end, we recommend a German initiative be launched that establishes a sustainability panel aimed at pursuing new multilateral approaches”, comments Heidemarie Wiezcorek-Zeul, former federal minister and current member of the German Council for Sustainable Development. The Federal Government needs to think ahead, she continues; according to her, only via such an initiative will the UN’s Sustainable Development Summit planned for 2019 be able to develop the political leverage it needs. In its statement, the Council emphasises the significance of the UN’s High-Level Political Forum (HLPF) as the institutional home of the global Sustainable Development Goals (SDGs) and as a platform for the multilateral exchange of information on respective national experiences. The Council is of the opinion, however, that the HLPF needs to be positioned much more strongly as a multilateral driver for realisation of the 2030 Agenda. The Council advocates stronger interlinking of national and global responsibility as well as mutual results-oriented guidance in the form of peer reviews comprising both state and non-state actors, as modelled by the German peer review. Further, the Council recommends that the Federal Government place the focus on solving goal conflicts between the individual SDGs and their sub-goals in the ongoing monitoring at the United Nations. “Current practice neglects the interrelation between the goals and thus the corresponding necessity and efficacy of collaboration,” emphasises Heidemarie Wiezcorek-Zeul. The German Council for Sustainable Development (RNE) was first called into being by the German government in April 2001. The Council consists of 15 public figures. The Council’s tasks include generating contributions to the German Sustainable Development Strategy, specifying concrete fields of activity and projects and also providing contributions that make sustainability a public issue of vital importance. In selecting the topics it deals with and the forms of action it employs, the Council operates independently. Results of its ongoing work include the Sustainability Code; recommendations regarding the German Sustainable Development Strategy, the global Sustainable Development Goals, climate policy, raw materials policy, fiscal sustainability and organic farming; the founding of the Hub for Sustainable Finance; the civil-society initiatives of Project Sustainability; strategy dialogue with city mayors on sustainable urban development; input from youths and young adults regarding municipal sustainability and German sustainability policy; as well as articles on the subject of sustainable business, among other things.